Eventually a light bulb is bound to burn out and when it does, you may want to choose something brighter. This is where bulb wattage comes into play. Their ratings are something you’ll want to have a better understanding of before you go shopping for a new light bulb. When you look at a light fixture, you’ll see that it has a maximum bulb wattage rating. This is something that you should follow so you don’t risk having a house fire. 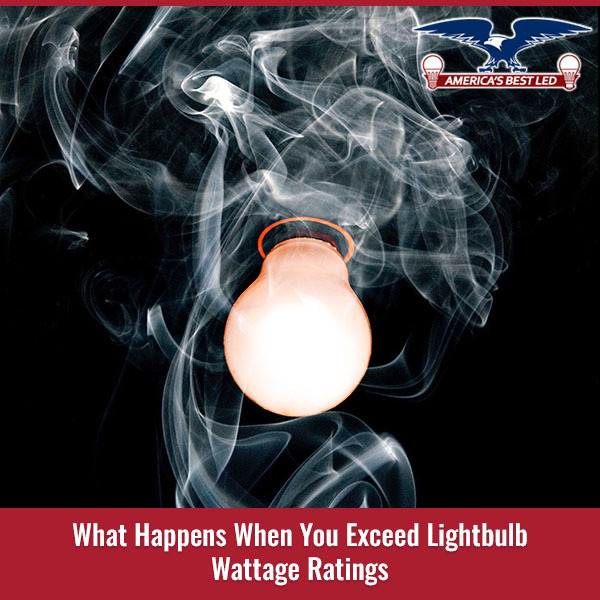 By installing a bulb that exceeds the recommended socket wattage rating often results in detrimental effects. Even if you don’t have a fire in your home, you may still damage the fixture’s sockets or its wiring. None of these things are ones you want to deal with so you shouldn’t leave them to chance. Instead, the next time you want a brighter bulb but are prevented from getting them because of the wattage rating on your light, you should opt for a LED bulb instead. To begin with you must understand that LED wattage emits less heat than that of incandescent bulbs of equal bulb wattage. This is why many manufacturers have chosen to not only list the wattage the LED bulb consumes, but also what it’s equivalent to in terms of incandescent bulbs. For instance, when it’s listed on an LED package that the bulb is a 60W equivalent, you’ll know you have a bulb that emits the same amount of light as you’d receive from a 60W incandescent bulb. Pay attention to the LED wattage itself and you’ll see that it’s much lower than that of an incandescent bulb. However, a LED light will consume 80% less energy so you can get the amount of output you want from a light without worrying about exceeding your fixture’s wattage rating. At the same time, you’ll also be lowering your electric bill. Understanding how LED and incandescent bulbs is important, but these comparisons aren’t always available. Sometimes you’ll find different types of LED bulbs being compared to the type of bulbs they’re replacing instead. For instance, when you want to replace a fluorescent T8 bulb you must compare the LED wattage to the fluorescent bulb wattage. Likewise, when you choose to replace a HID (high intensity discharge lamp) bulb, you must look at the equivalency that’s given for this as well. There will be times when you’re bound to come across a light fixture that doesn’t have a bulb wattage rating that’s clearly marked on it – or at least you can’t find it because over time it’s disappeared. When this happens, you can still use LED lights because they consume such a small amount of power that even a bulb of the same wattage is safe in your light fixture. Keep in mind that older fixtures’ wiring isn’t as dependable as more modern day wiring so you’ll want to choose a lower wattage here anyway. At America’s Best LED we understand that a lot of this is very confusing to most people. That’s why we strive to make ourselves available to you so you can have your questions answered and rest assured that you’ve chosen the best bulb for your fixture. We’re also here when you’re ready to upgrade your fixtures to new LED ones. Regardless of what you need, you’ll find that we’ve helped many customers over the years to install LED lights and start enjoying their cost effectiveness. You should be next when it comes to saving money by using LED, so make sure you get in touch with us today.